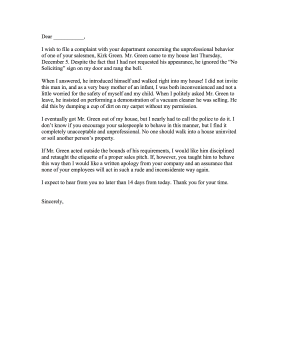 A salesman has behaved unprofessionally and aggressively in this complaint letter from an angry homeowner. I wish to file a complaint with your department concerning the unprofessional behavior of one of your salesmen, Kirk Green. Mr. Green came to my house last Thursday, December 5. Despite the fact that I had not requested his appearance, he ignored the "No Soliciting" sign on my door and rang the bell. When I answered, he introduced himself and walked right into my house! I did not invite this man in, and as a very busy mother of an infant, I was both inconvenienced and not a little worried for the safety of myself and my child. When I politely asked Mr. Green to leave, he insisted on performing a demonstration of a vacuum cleaner he was selling. He did this by dumping a cup of dirt on my carpet without my permission. I eventually got Mr. Green out of my house, but I nearly had to call the police to do it. I don't know if you encourage your salespeople to behave in this manner, but I find it completely unacceptable and unprofessional. No one should walk into a house uninvited or soil another person's property. If Mr. Green acted outside the bounds of his requirements, I would like him disciplined and retaught the etiquette of a proper sales pitch. If, however, you taught him to behave this way then I would like a written apology from your company and an assurance that none of your employees will act in such a rude and inconsiderate way again. I expect to hear from you no later than 14 days from today. Thank you for your time.